A newly published study shows that in certain circumstances a pool of dense particles normally circling Earth can extend a long arm out to meet and help block incoming solar material. In the giant system that connects Earth to the sun, one key event happens over and over: solar material streams toward Earth and the giant magnetic bubble around Earth, the magnetosphere helps keep it at bay. The parameters, however, change: The particles streaming in could be from the constant solar wind, or perhaps from a giant cloud erupting off the sun called a coronal mass ejection, or CME. Sometimes the configuration is such that the magnetosphere blocks almost all the material, other times the connection is long and strong, allowing much material in. Understanding just what circumstances lead to what results is a key part of protecting our orbiting spacecraft from the effects of such space weather. In the March 6, 2014, issue of Science Express, Walsh and his colleagues compared observations from the ground and in space during a solar storm on Janruary 17, 2013. This was a fairly moderate solar storm caused by a CME impacting Earth’s magnetosphere for several hours. 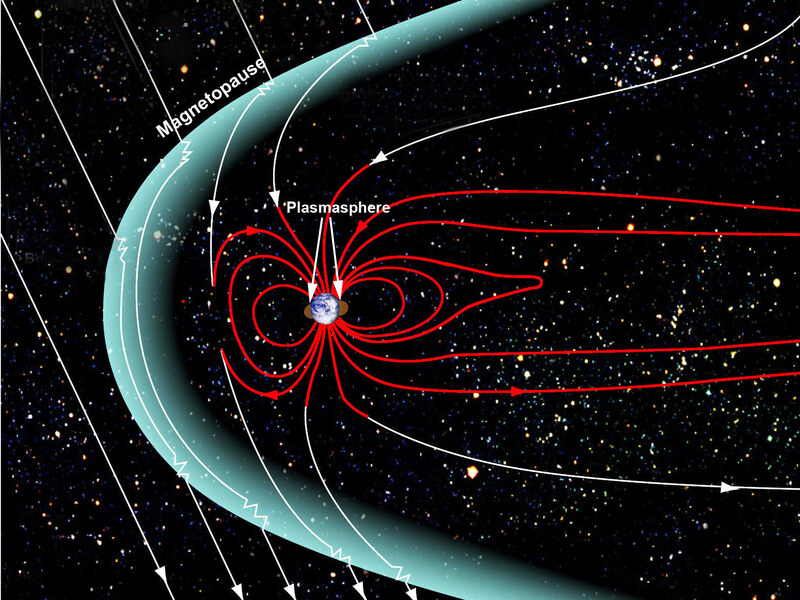 As the CME encountered the boundary of the magnetosphere, its magnetic fields and those around Earth realigned in a process called magnetic reconnection, which allowed energy and solar material to cross the boundary into the magnetosphere. NASA’s three THEMIS – for Time History of Events and Macroscale Interactions during Substorms – spacecraft were in the right place at the right time, flying through the magnetosphere’s boundary approximately 45 minutes apart, and caught this interaction. Closer to Earth, scientists could also study the sphere of cold dense gas at the very top of our atmosphere. This region is called the plasmasphere and it’s made of what’s known as plasma, a gas made of charged particles. GPS signals travel through the plasmasphere and they travel at different speeds depending on how thick or thin the plasmasphere is along the journey. Tracking the GPS radio signals, therefore, can help researchers map out the properties of the plasmasphere. THEMIS showed that the tongue of this cold, dense plasmasphere material stretched all the way up to the magnetic reconnection point where the CME had made contact with the magnetopause. The three sets of THEMIS observations demonstrated that the plume had a dramatic impact on the characteristics of the magnetic reconnection region. As scientists try to better understand the space weather system around Earth, they rely on multipoint observations such as this to connect what’s seen on the ground to what’s seen in space. In this case THEMIS data connected to GPS data, but such combinations are increasingly being used to watch how Earth is affected by its closest star. Eventually such observations could lead to improvements in space weather predictions, which would be as useful for spacecraft operators as terrestrial weather forecasts are for us here on Earth. 1 Comment on "Scientists Discover New Process that Protects Earth from Space Weather"
Today scientists speak of gravitational forces that hold the heavenly bodies apart from each other and prevent them from colliding with each other. How was this to be conveyed to the first readers of the Qur’an? God tells us in the Qur’an that He is the One Who raised the sky (Qur’an 55:7) and that he holds it back from falling on the earth (Qur’an 22:65).